Good Neighbor Pharmacy came to us stuck in a classic battle of David and the Goliath. With a re-evaluation of the core values and the help of passionate store owners we built an anthem. The "Locally Owned. Locally Operated. Locally Loved." campaign was new found leverage to wield. 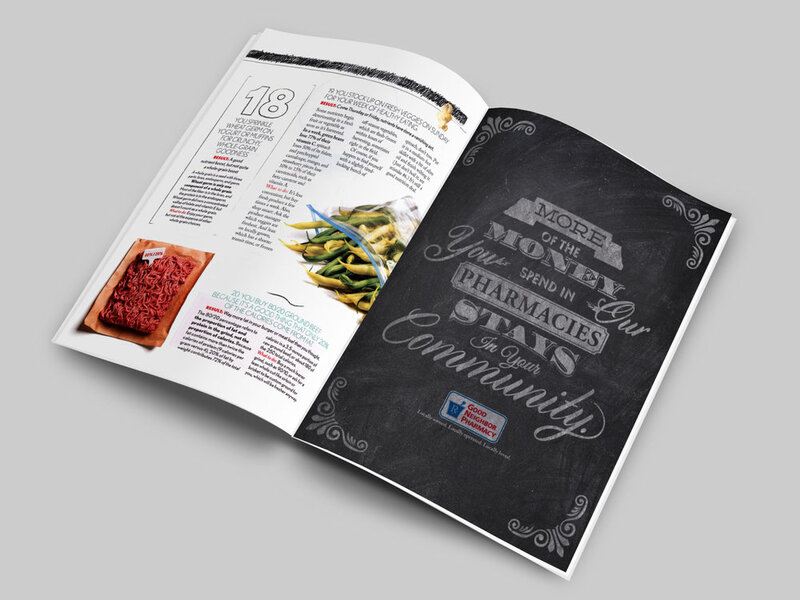 Personal Role: To kick off the Locally Loved campaign we launched the Good Neighbor Pharmacy home grown print campaign which disrupted the pharmaceutical add space and was later recognized at the Philadelphia ADDY awards for best news print series. While I helped design various pieces of this campaign the above posters are three of my original designs that made it to print. Back to the roots we went reevaluating what makes each individual pharmacy so special. 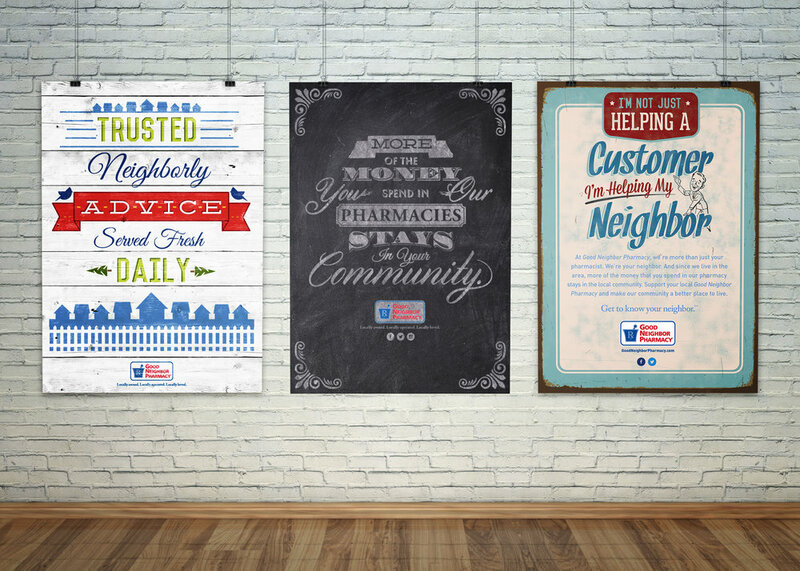 Good Neighbor Pharmacy needed something original, something energizing, something different from the traditional white bread pharmaceutical branding. We kickstarted the rebrand with a fresh new tagline and a authentic new look. The "Locally Owned. Locally Operated. Locally Loved." rallying cry was born and the new home grown print campaign lit the way. Digital / Testimonial: "Respiratory Health"
Superior customer service doesn't only keep customers coming back it keeps them healthy and the small businesses they support alive. Good Neighbor Pharmacists pride themselves on a straight forward friendly approach that is second to none when it comes to customer service. But don't take our word for it these straight scoop testimonials speak for them self. 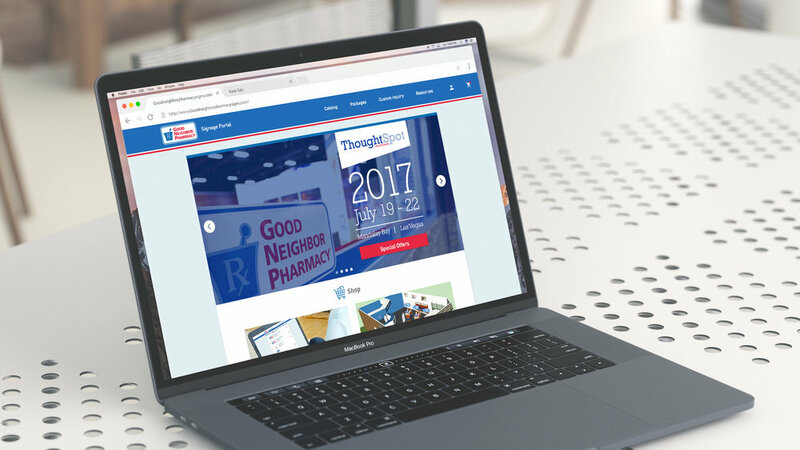 Personal Role: Design an website catalog for Good Neighbor Pharmacy where members can log on, browse, order, track, and install branded signage from. Transpharmation is a project to help keep less fortunate stores looking and performing their best. Along side a talented team of coworkers and a brilliant production team we brought Transpharmation to life and successfully revitalized a select few Good Neighbor Pharmacy's. My personal role was to assist with designing the interior and exterior branding, signage and large scale graphics that the remodeling team needed. Good Neighbor Pharmacy is genuinely committed to the communities they serve and giving back is a perfect way to keep things thriving. We decided to partner with KaBOOM! and sponsor playgrounds builds for deserving communities across the United States. Over 200 Volunteers from the local community came out to help and the playground erected in a single weekend.